Spend your holiday in the special atmosphere in the listed water tower. 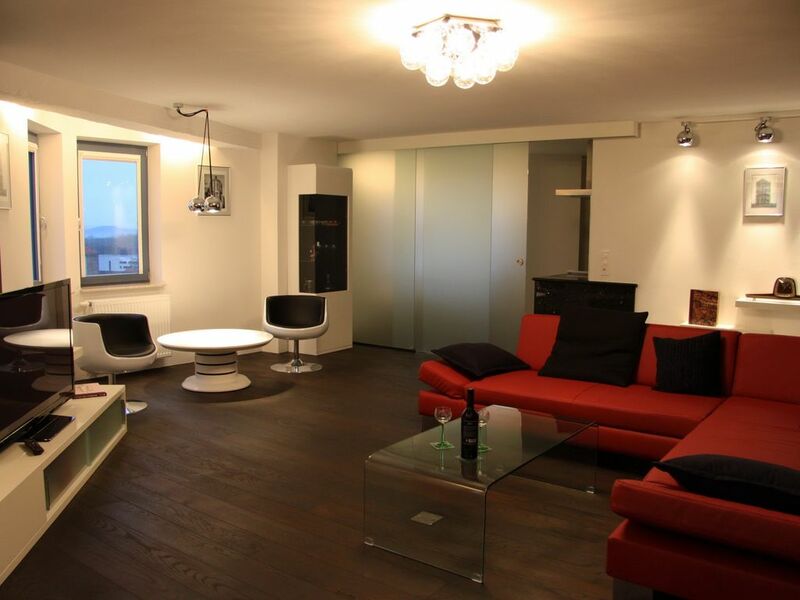 In our new and modern designer holiday apartment you combine elegance and exclusivity. This is located in the tourist heart of Güstrow and is within walking distance to the town center. During your holiday you will not miss anything. This starts on the first day with the arrival in your accommodation. The apartment has 30m in height above the rooftops of Güstrow a fantastic 360 degree view over the historic old town, the castle and the picturesque surroundings of the city. The very spacious new apartment is equipped with high-quality materials (eg. B. Real wood floor boards) equipped and has solid comfort. This is on the whole. 8 Floor of the water tower. Comfortable with an elevator to reach the apartment. In the hallway already are still parts of the historic water tank to see. In the living room there are a pleasant leather furniture, a couch and the room being fitted tasteful furniture. Facilities include a large television, a stereo system and a selection of board games. Directly connected is the kitchen with a nice dining area with views of the city. This can be easily separated by a sliding glass wall from the rest environment. The floor and the kitchen worktop are made with a high quality and matching granite. In the modern kitchen makes cooking fun on vacation, because the device comprises in addition to crockery and all kitchen utensils a 4-burner stove, refrigerator, dishwasher, oven and coffee maker, kettle and toaster. Through a small hallway where there is the entrance of the apartment, you can reach the beautiful designer bathroom and the bedroom. The bathroom has a vanity with a large mirror, a confortable bathtub, a pleasant rainforest shower with various functions and toilet. Exclusivity, design and a fantastic view here are reflected particularly again. In addition include a hair dryer and an integrated radio conditioning. The large bedroom with adjoining dressing area is very pleasant. With different lighting scenarios can be the space in different ways, depending on your mood, illuminate. The double bed has a size of 1.80 x 2 m. Again, there is an LCD TV. The apartment can be booked for 2-3 persons. The bathroom has a vanity with a large mirror, a confortable bathtub, a pleasant rainforest shower and toilet with different functions. Exclusivity, design and a fantastic view here reflect particularly again. In addition, include a hair dryer and an integrated radio conditioning. Oase Gustrow: Welcome to the sunny island! Experience, enjoy, relax - here you will find lively pleasures, moments of deep relaxation and a great variety of sports. Bathing in many variations, our world of experience. Fantastic saunas from around the world provide indoor and outdoor area for your recreation and comprehensive wellness program leaves no wish unfulfilled. Nature & Environment Park Güstrow: bears, wolves and much more ... Of course, wild and strong as a bear! Thus, the Park presents the large and small nature lovers. Bears, wolves, deer, owls, eagles and many other animals are within reach and can be seen at night not only during the day but. NEW: predator WG On 200 acres over 1000 animals live in 76 species in the walk-part enclosures and aviaries as well as in an underwater world for walking through. We stayed in the converted Water Tower apartment 8 for 5 nights....only problem with this apartment was we did no want to leave. The apartment ticks all the boxes. Great bed, huge bathroom with great water pressure for the rain shower, shower head. Big TV in lounge room. Kitchen has everything, TV in the bedroom. Everything was spotlessly clean. Wi Fi great. The list is to long for here. Oh the views from the apartment ....WOW. The lift takes you to the 8 th floor ....just open the door and enjoy. The owner and his family were great to talk to nothing was a problem. There is plenty to do around Gustrow and its surrounds. Enjoy the Water Tower. We did. Diese FEWO im ehemaligen Wasserturm ist einzigartig! Der fast 360Grad Ausblick über Güstrow ein Erlebnis! Die Einrichtung ist individuell und man merkt die Liebe zum Detail. Von der Ausstattung her fehlt es an nichts. Die Vermieter sind sehr nett.Unbedingt zu empfehlen, wir kommen wieder!!! der Blick über Güstrow aus dem alten Wasserturm ist toll. Die Wohnung ist geschmackvoll eingerichtet (leider selten bei ferienwohnungen) und insbesondere das Bad ist der Knaller. Der Besitzer ist zudem noch sehr freundlich und der Mietpreis war günstig (wie waren allerdings auch im Februar hier). Volle Empfehlung von uns. Hochwertigste Ausstattung in traumhaftten Wasserturm mit Ausblick über ganz Güstrow. Das war unsere schönste Ferienwohnung. Eine absolute Mietempfehlung. Wir haben ein sehr schönes Weihnachtsfest in der Wohnung erlebt. Die liebevolle Dekoration mit kleinen Geschenken hat uns sehr berührt. Vielen Dank nochmal. The apartment is located in close proximity to the city center. All locations read very well within walking distance. In addition, a bakery and a grocery store are just around the corner. Eine Kaution von ist vor 100€ ist vor Übergabe der Ferienwohnung zu entrichten. Kurtaxe wird nicht erhoben. Bettwäsche / Handtücher bei Bedarf optional pro Person 13€. Service: Alle Nebenkosten wie Wasser, Strom, Heizung und Endreinigung sind ebenfalls im Preis enthalten. Ein Kinderhochstuhl und ein Babybett können bei Bedarf bereit gestellt werden.